And, here’s what I came up with using the kit along with some items of my own. 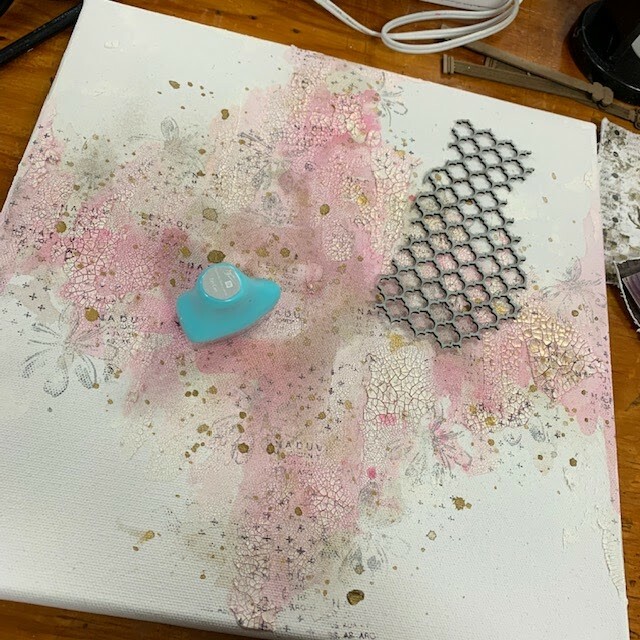 I ripped up some of the tissue paper and adhered it randomly with 3D Gloss Gel that I added to the canvas as a glue, then once again over the tissue paper to seal it. 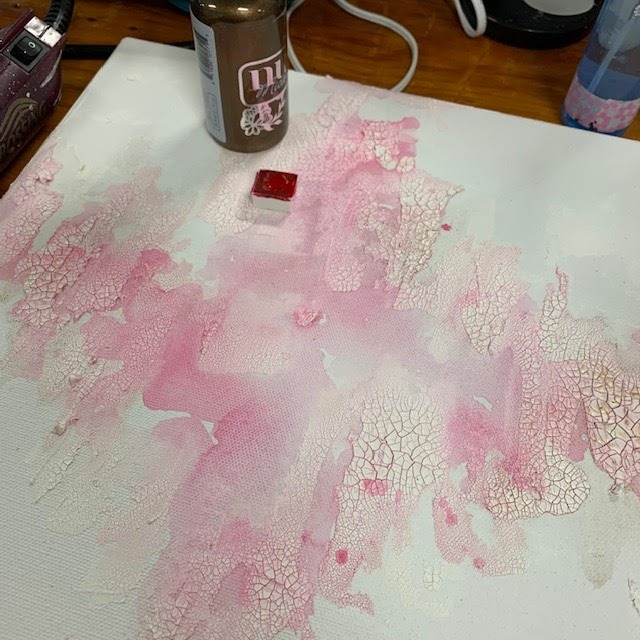 Next, I added some of the cream texture paste to the canvas everywhere that the tissue paper was not, adding some to the edges of the tissue paper as well. I added the cool grey and moss texture pastes as well. 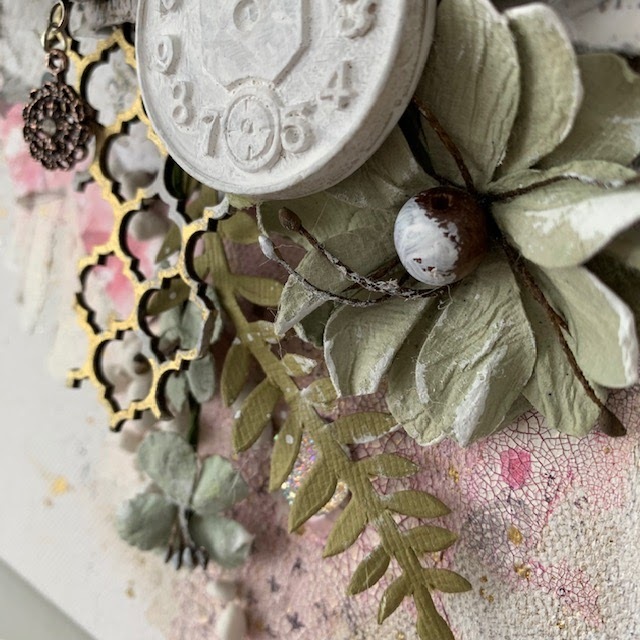 I painted the Prima resin frame with the black gesso, and once dry, I also dry brushed the frame with some of the moss texture paste. In this close up, you can see how the cream texture paste is able to blend perfectly with the tissue paper. I added some flowers and gears from my stash. 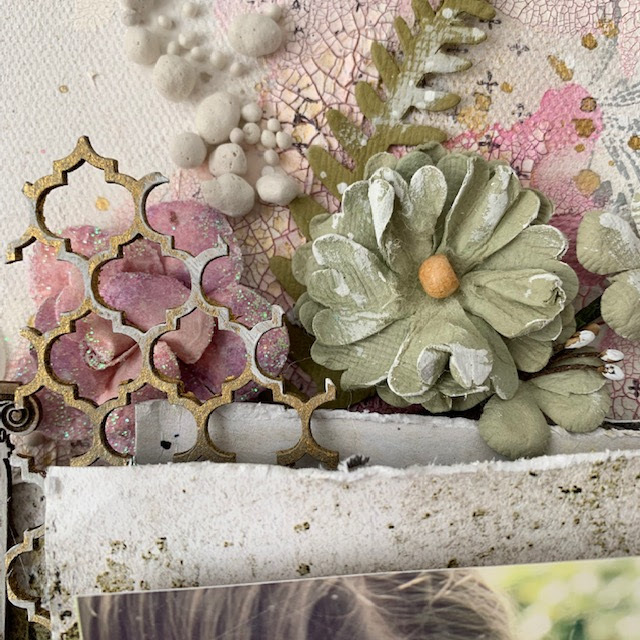 This closeup shows one way to “blend” the texture pastes- the colors go together perfectly. The bee is a piece of junk jewelry I had. Hi everyone, Kim here with another edition of Mixed Media Monday. 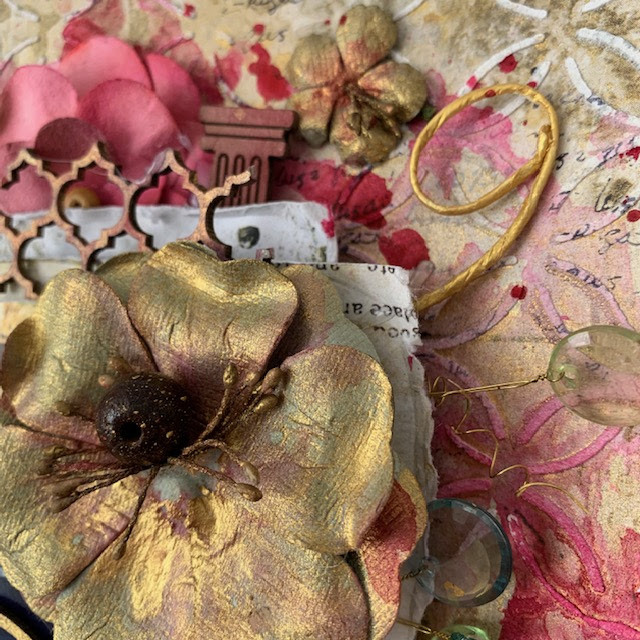 Today I am going to be sharing my project created with the Mixed Media kit. I also have a video to share of the process. 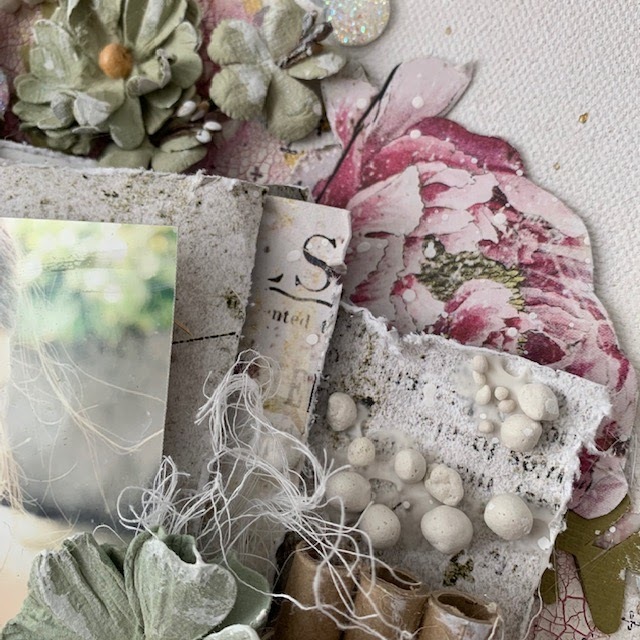 This month’s card kit features Prima Marketing texture paste and this cute 4×4 canvas. Also included is a resin frame, black gesso and the brand new Finnabair rice paper sheets. I love the texture paste, and I have worked with them before. This was a fun, but messy project to create. 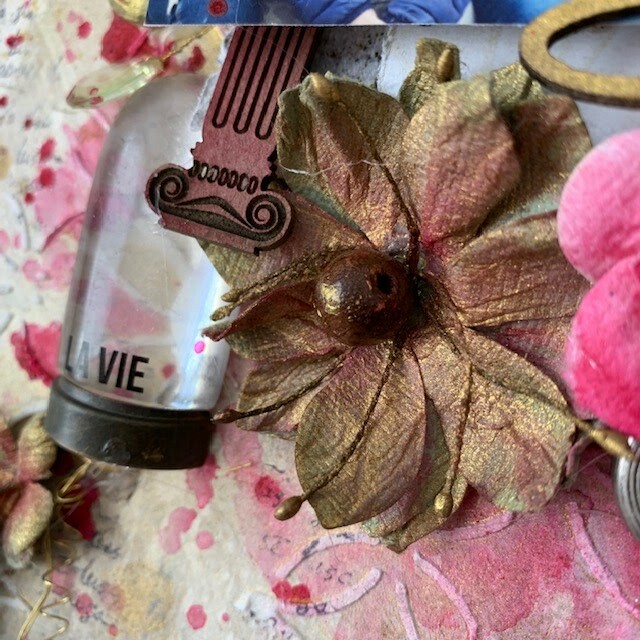 I added some flowers, resin and lace from my stash. I was really anxious to share with you this project because I love it !!! It happens once in a while where I really am proud of what I did ! 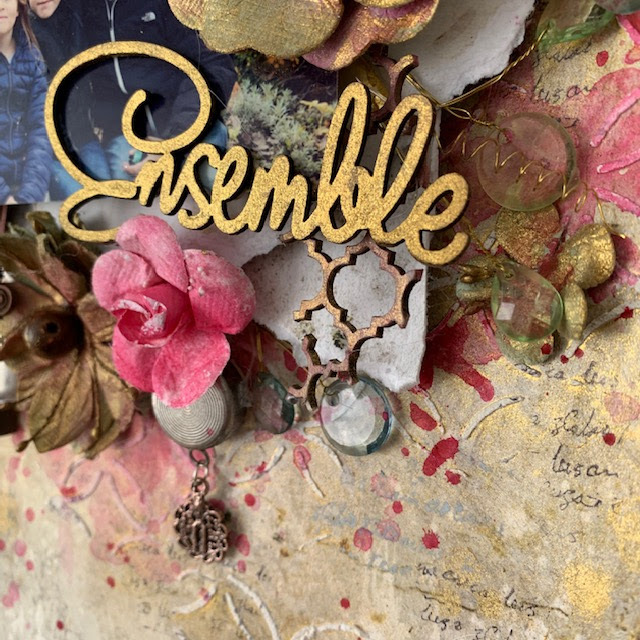 My project was made with the Scrapbook kit, filled with so many beautiful products. I decided to work with a canvas this time for this layout, this is something I wanted to try for a long time. 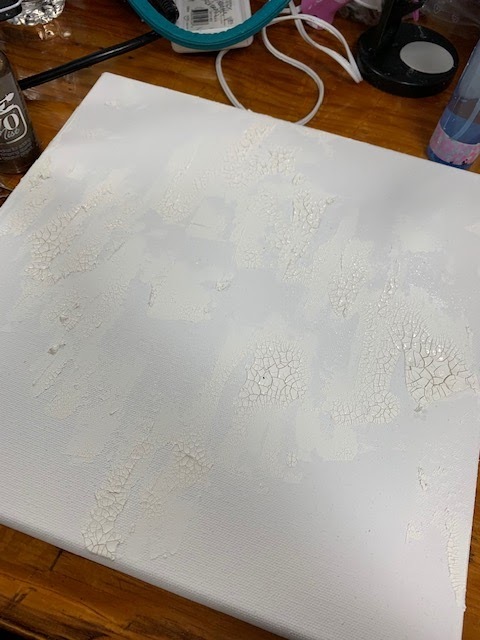 First thing I did was apply Crackle Paste on the canvas and let it dry during the night because the crackle is always better if it dries without heat. the paste I used is from Finnabair, however I heard that it is discontinued…. There are other brands available on the market. I really wanted to use Pink for this layout, so I used watercolour for the background along with the Gold Nuvo Spray included in the kit. The 2 colours went very well together. After the colours were dry, I used different stamps from my stash with the Chalk from the kit, which I also used on a peace of chipboard. This Pink flower was cut out from one of the papers from 49 and Market and that was my inspiration for the colours. I was in love with this paper ! I cut out the bottom and put it on a beautiful flower background (this was done only at the end) . I put a coat of clear gesso first, than used a stencil with Modeling Paste. As you can see on the photo, I took some Mint paint from my stash (Art Alchemy from Prima) and mixed it with water. As you can see here, I used other colors too after putting different flowers from the kit. So many possibilities with these Mintay Papers !! You can cut out so many Ephemeras, ATC’s and flowers, I love that ! There are also gorgeous Ephemeras from Prima which I used as a title. The word confidence is from a Prima sticker sheet also included in the kit. Hi everyone, Kim here. 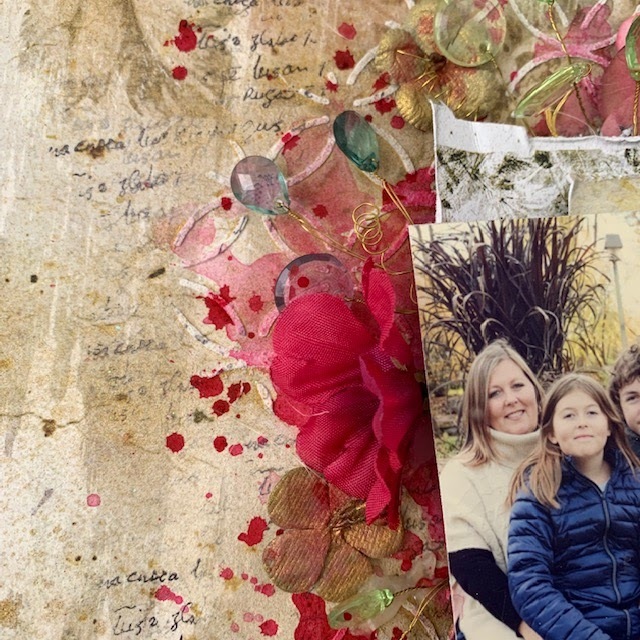 Today I am going to be sharing my project created with the Mixed Media kit. I also have a video to share of the process. This month’s card kit features Lindy’s magical shakers and this amazing 12×12 chipboard circle from AB Studios. Also includes are several ephemera sheets for cut outs and a few other embellishments. I love Lindy’s sprays, and I have worked with the magicals before. This was a fun project to create. I prime the chipboard piece before I used the magicals. I also used some copper and clear crackle paste (from my stash) on it prior to adding the magicals. For the ephemera, I used lots of foam tape to give the layers some dimension. The same with the flowers and butterflies. 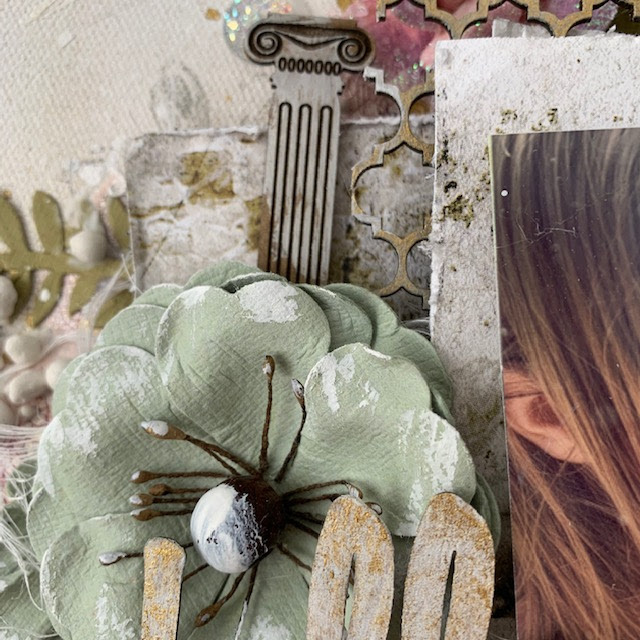 The lace doilies are from the March Scrapbook kit. 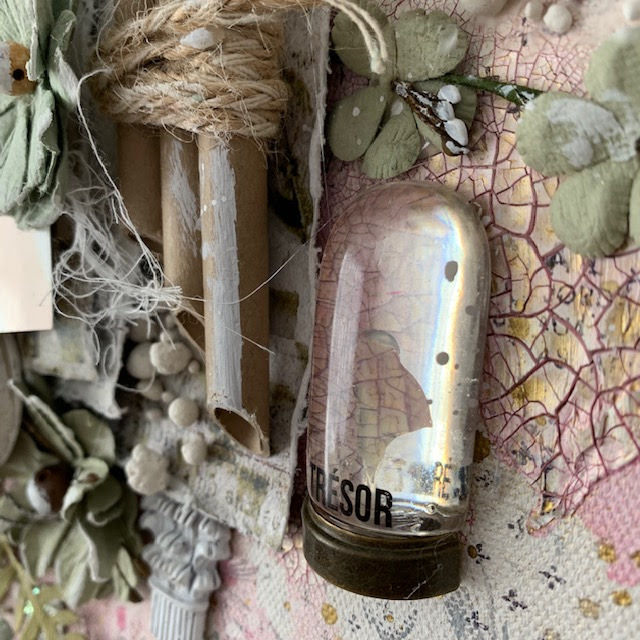 Today I am sharing a project I made with items from the scrapbook and mixed media kits. This is a small watercolor panel from my stash. I started out by adding some stenciling, which I let dry completely, then sprayed with water, and while still wet, I added some of the blue Prima Marketing liquid watercolor. The panel was very wet, so I picked up the excess moisture with a paper towel, and hit it with a heat gun. 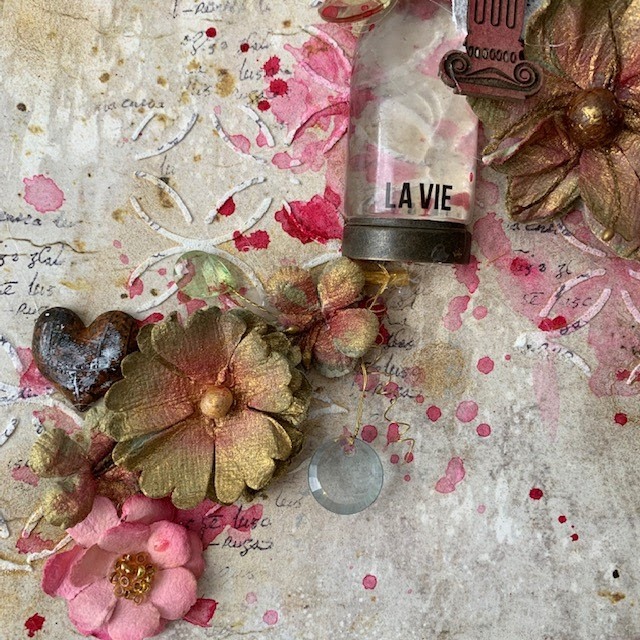 Next, I painted the Creative Embellishments heart chipboard pieces with white gesso, then added the red liquid watercolor. Once dry, I added the black liquid watercolor to the panel and chipboard pieces, then quickly wiped it off with a paper towel to get a grungy, weathered result. In this closeup you can see how well adding the black liquid watercolors created the distressed tones. Next, I added the chipboard, as well as the rest of the embellishments, all from the kit except the clip. Lastly, I added some of the Prima Marketing metallique wax in turquoise satin to the entire piece.